Simple to use. 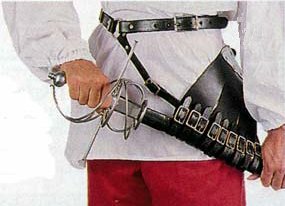 The rapier scabbard fits through the leather loops in the carrier at the best angle for quick access. The two-piece design means that no matter who wears the belt, the carrier still hangs at the proper angle. Hand crafted from the finest quality leather. Available in right or left-handed versions in black leather with silver nickel hardware. Our adjustable size fits most average size men.